My life is filled with dreams, desires and dandelions. Those pesky little sprouting weeds of thought. As hopes and plans germinate lists in my head…some find their way to pen and paper- others are left unattended. 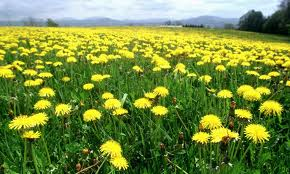 The neglected ones multiply daily thus the dandelions quickly and effortlessly emerge. Like many planners, I tend to strategize and trick myself into a false sense of internal organization- all under the guise of control. But I can never rid myself of those pesky dandelions. Upon rising to start a new day, they greet me, calling attention to themselves…reminding me that I am really never in control. There is something to learn from the dandelions of life. While I could continuously pull and dig, pick and spray, they seem to always find a way back into my life. I am now trying to appreciate their sunny yellow bright flower- much like I did as a child. I am now attempting to stand up a bit to tomorrows’ lists and desires. Admiring today for what it is – is most important…dandelions and all.